Welcome to a new series which lets us shine a light on some of London’s best artisan producers and food businesses that attend markets around the city. 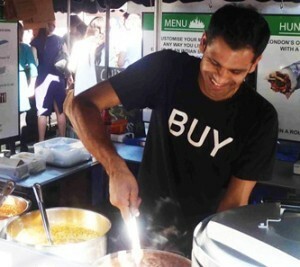 Chula Fused Foods is the brainchild of Vinod Patel, a man well placed to deliver his take on the burrito. He spotted the full potential of street food in those heady pre-Meatwagon days when London’s offering still consisted primarily of pallid sausages and playing Russian Roulette with e coli. And for that matter, the heady pre-Wahaca days when our Mexican know-how didn’t go much further than Old El Paso. Yep, you’ve guessed it: Vinny had travelled to the States. Back in town and following a foodie path, Vinny started work in the first UK outpost of American super-chain Chipotle. Moving through four ranks from ‘crew member’ to ‘service manager’ in record time, he was in training to become a store manger when he decided once and for all that the corporate food world wasn’t for him and took the leap of starting his own business. Following a jaunt around India - where Vinny has family roots – and back to America for some serious flavour research, the concept of the fused Indian-style burrito was born. A look at the slickly branded Chula Fused Foods stall now shows the Chipotle influence. It’s simple, clean, efficient and choice-led. The quaint, rustic, small-producer look is not what Vinny is going for – this is professional catering albeit on a smaller and much more artisanal level. There are five varieties of wrap available, spanning chicken keema, lamb curry, methi paneer and red kidney bean. Or, of course, a mix of any of these. They’re served packed with fresh salad and salsa in a freshly warmed tortilla wrap. We spotted the number of first-name regulars the stall has accrued when we popped by Lower Marsh market last week, and we can see why. This is hearty, wholesome food which packs a sensory kick. It ticks the eco and ethical boxes with ingredients sourced as locally as possible, and at a push we can convince ourselves that it’s pretty damn healthy, too. If you don’t want the wrap (or can’t eat gluten) you can have it in a takeaway burrito box, so no one need miss out.